Rugged and beautiful—the Amalfi coast seduces those who gaze upon its cliffs and enticingly blue waters. Unsurprisingly an inspiration to authors like John Steinbeck and William James, the coast has also been frequented by the likes of Winston Churchill and Greta Garbo. The star studded destination does not disappoint as you witness the mountainside filled with Arab-Sicilian architecture amongst lush pastures and vineyards from the comfort of your luxury yacht. Stepping into Amalfi, the town the coast was named for, soak in the history the city embodies being one of the most historic towns along the coast. Nearby Ravello is renowned for its gardens, historical villas and The Duomo, Ravello’s cathedral. Off the coast lies Capri, the inspiration behind the popular 80s beverage Capri Sun, which is fitting due to the sun-kissed idyllic nature of the island. Home to the infamous Blue Grotto, be sure to take a tender ride to snorkel or swim in the sapphire waters as part of your Amalfi Coast charter. Begin your journey with flair starting with Naples; the city perched upon the Bay of Naples, home of Mount Vesuvius. Despite its torrid past Naples is now one of Italy’s most gastronomic regions due to the rich bounty of the volcanic sands and its proximity to the sea. Before setting sail to Capri, be sure to try a frittanine—a deep fried pasta ball stuffed with minced pork, béchamel sauce and peas. Apart from the infamous Blue Grotto, the island of Capri, which was one home to Roman Emperor Tiberius, offers a variety of things to do for land-loving yachters. Around the marina is a lovely boardwalk where you can dabble in small shops or jet up to the main town by funicular. In town visit upscale boutiques or relax at an outdoor café in a piazza as you watch the passers-by. Good things do come in small packages. Once a popular aristocratic destination, Amalfi has maintained its charm as clusters of white buildings hug the mountainous backdrop. Here, lemons are the dominant theme so be sure to try some limoncello which is made from the fresh grown, local lemons. After you’ve sipped your limoncello, taxi to nearby Ravello and visit Villa Rufolo and the public gardens of Villa Cimbrone, famous for its panoramic views. 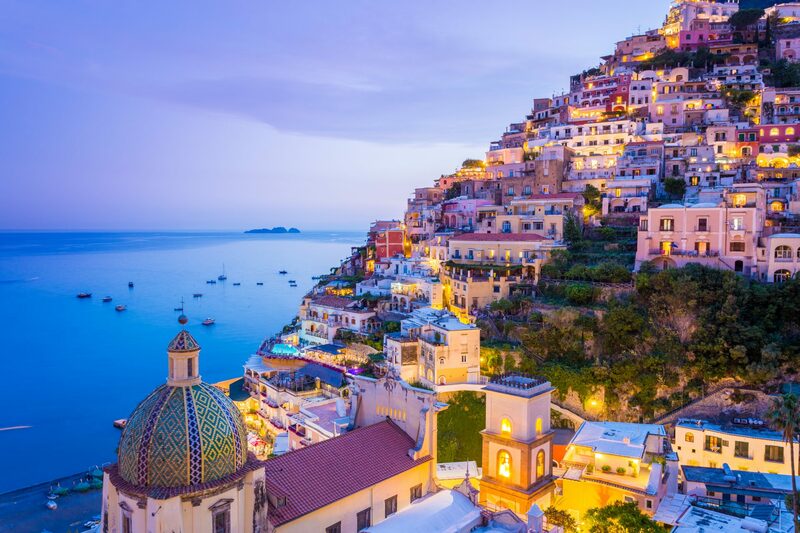 Finally, cruise to Positano, often referred to as the coast’s most picturesque towns. Approaching the town from the sea, it’s easy to see why with its multi-colored, pastel stacked seemingly impossibly on top of one another. After a day of exploration, set sail to Salerno. Dock at the Salerno Marina where a private car will be waiting to take you to visit the ancient ruins of Pompeii. Be transported back in time while you explore the archeological site and feel the weight of what was once sophisticated and thriving Roman city. When you return to Salerno, reflect on your day over an alfresco meal at sunset. Today your destination is the Sorrento Peninsula. Separating the Gulf of Naples form he Gulf of Salerno, the peninsula is anything but dividing as it features beautiful hiking trails that make you feel united with nature and the beauty of the coast. Weather permitting you’ll anchor overnight at the Sorrento Peninsula, otherwise, head back to Capri for the evening. In the morning, make way for Ischia, a volcanic spa island with sulfur springs and medicinal bathing areas. Drop anchor and visit one of the many natural thermal springs the island is renowned for. Stop at a restaurant for lunch to enjoy the local specialties of rabbit and rucolino, a green, licorice-tasting drink made from rucola leaves. In the afternoon, tour the many towns of Ischia including Ischia Porto, Ischia Ponte and Ischia Casamicciola. Return in the evening and depart for Naples. Upon arrival in Naples, enjoy your last Italian meal on your superyacht while you bask in the warm Mediterranean sun, then disembark to begin your new journey.